For months we had to scan Kauai’s mouth-watering menu and drool over the delicious dishes we could not devour. Every Vitality Rewards Meal became a complex in store interaction involving the swapping of ingredients for a feel-good Warm Indie or Asian Rainbow Bowl. Even the smoothies had to be dissected; honey-infused coconut water replaced with apple juice and frozen yogurt exchanged for extra bananas – at an extra cost of course. 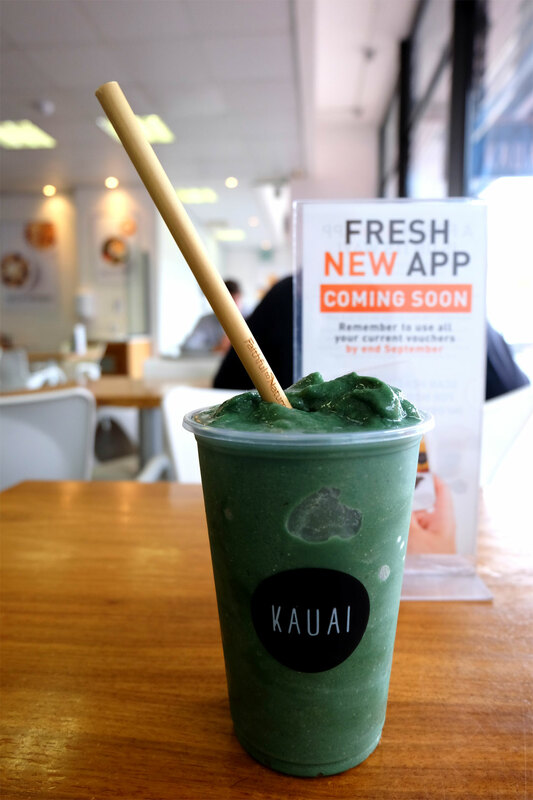 Thankfully, Kauai didn’t turn a blind eye to the vegan hate mail, social media spam or continuous customer complains 😉 Instead, they just launched a protein-packed PLANT POWER salad and vegan NATURE’S PROTEIN smoothie. The NATURE’S PROTEIN SMOOTHIE (R55 for a large) is a creamy green drink made with vegan protein, hemp seeds, spirulina, banana, pineapple, coconut milk, and pressed apple juice. It’s perfect as a post-workout meal – especially since my Virgin Active has a Kauai outlet inside the gym. The PLANT POWER salad (R85) initially seemed very (VERY) vegan… greens, beans and sunflower seeds. But each bite is bloody delightful and it is definitely a meal I am happy to munch. This beautiful bowl boasts lentils, avo, raw cashews, orange segments, green beans, cabbage, rocket, curried sunflower seeds, kale, greens, and a creamy vegan almond butter dressing. ALSO – Kauai recently added mushrooms as a substitute for chicken or cheese at no extra cost. Try it in the MOROCCAN wrap, MEXI wrap or THAI CRUNCH wrap. The WINTER NOURISH bowl (minus the parmesan) is also pretty good, but it better resembles a soup than a stew. Kudos Kauai, we love that you listened to your vegan fans and appreciate the tasty new additions. Now it’s up to us – please give Kauai some vegan love to show your support and encourage them to add even more marvelous vegan meals to their menu. Order their new additions and #share your feast on social media by tagging Kauai on Facebook, Twitter and Instagram.